I have several friends who are wonderful cooks/bakers and two are that are pumpkin lovers as well. When I make pumpkin muffins (very often! ), it is one of these two recipes because I just can't decide which I like better. And, yes, we've done the blind taste test. (Have I told you that I love pumpkin?) So, enjoy and let me know if YOU can decide!! Stir until wet and dry ingredients are incorporated but don't overmix--unless you like rubbery baked goods. Using the ice cream scoop divide batter into 12 lined muffin cups. Take out your giant Costco bag of chocolate chips and sprinkle 4 to 5 chips on top of each muffin. 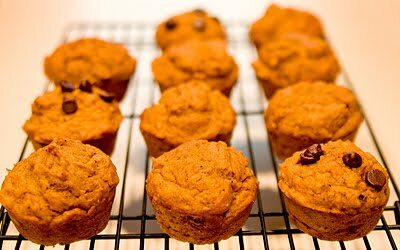 This entices the children to eat the muffin without overpowering the healthful ingredients.